Machine Learning time-to-train reduced significantly with scaled clusters connected with Intel® OPA. The ever-increasing volume, velocity, and variety of data is creating both challenges and opportunities in every industry as they increasingly deploy AI/Machine Learning for their digital transformation. Training a model with larger datasets typically produces more inferencing accuracy but this ...could take weeks/days. 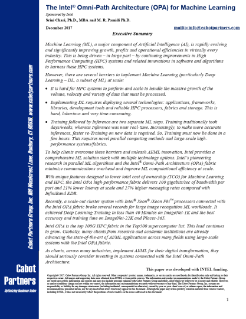 Parallel HPC-like systems coupled with productivity-enhancing software tools and libraries are increasingly being used to scale ML efficiently, particularly as faster Training and retraining on new data become key requirements to improve Inference accuracy. Intel provides a comprehensive AI/ML solutions portfolio with optimized frameworks, development tools, libraries, multiple high-performance processors, and the Intel Omni-Path Architecture (Intel® OPA). Intel’s pioneering parallel computing research in AI/ML and unique Intel® OPA features reduce communications overheads and enhance computational efficiency at scale. In fact, recently, a large scale cluster system with Intel® processors connected with the Intel® OPA fabric broke several records for image recognition and other ML workloads. Leverage next-generation HPC fabric with robust architecture and feature sets designed for scalability. Discover how efficient use of specifically designed HPC clusters can give you an advantage over your competition.